Homage to White Tara, a Female Buddha exquisite with youth. Radiant as the eternal snows in all their glory, She sits on a white lotus and a silvery moon Indicating fully developed compassion and knowledge. Ged,ndrup came into his Gelugpa title, Dalai Lama, only posthumously, but his love for the goddess Tara was nurtured during his childhood, which he spent in a Kadampa monastery. The Kadam order ("Bound to the Proclamation") was founded by the Indian sage, Atisha (982-1054), who was "preserved by Tara, the patron deity of his former lives. "(2) Tsongkhapa too was inspired by Atisha's teachings; his reformed Gelugpa was styled the "New Kadam," and his teachings recognize Tara as the mother of all Buddhas, past, present, and future; transcendent, yet capable of intercession and compassionate action. By Atisha's day, Tara was an established goddess in India. Even very early texts, such as the Manjushrimula-kalpa and the Mahavairochana-sutra, place her near Avalokiteshvara, the bodhisattva of compassion, and the earliest known Indian images of her show her as a celibate consort of Avalokiteshvara, whose active role in compassionate work she eventually assumed. (5) By the ninth century, however, she had already appeared in the Buddhist cave-temples at Ellora as an independent savioress, who, like Avalokiteshvara, rescued those who prayed to her from both physical and psychological dangers. This role is implied by her name, which means both star and saviour, a reading that derives from the Sanskrit root tar, to "cross over," and, in the Buddhist context, means "to cross over the ocean of rebirths to enlightement." Her eight different forms as Green Tara, each one efficacious against a different peril, and her twenty-one forms, described in the Praise in Twenty-one Homages (Ekavamstatistotra), were all well-known to Atisha (see cat. nos. 103-106). Atisha's visions of Tara were inspired by the tantras, sadhanas (visualization texts), and prayers that described her in her green, or active form, but also by the potent, personal revelations of her contemplative white form granted to the Indian Vagishvarakirti (ninth-tenth century), who first conceived of her specialized function of "cheating death" and bestowing long life. (6) Atisha wrote an evocation of Vagishvarakirti's White Tara and another of Green Tara. White Tara, however, was more acceptable to the neo-orthodox hierarchy of eleventh-century Tibet, because she was the product of a personal vision, rather than a figure whose authority came through the tantras. During Atisha's brief sojourn in Tibet, it was his own abiding devotion to the goddess more than anything else that fueled the growth of her cult in a way that ignored sectarian lines. Zanabazar's White Tara was originally kept at the monastery at Erdeni-zuu, and in scale, style, and detail she approximates his extraordinary group of the Five Meditation Buddhas (see cat. no. 97). His Tara is a pubescent girl, exquisite in form and with an expression of focused, serious compassion. She appears just as the First Dalai Lama, Ged,ndrup, describes her in his poem, where she is revealed as the "Spiritual Mother" of the Buddhas, as the "Refuge of the World," and as she "whose head is adorned with Amitayus, Buddha of Boundless Life. "(9) White Tara sits on a moon-disc placed on top of a single lotus pedestal, erect and alert, and without any of the activating dÈhanchement usually seen in images of her. Nonetheless, her posture and even her flesh appear remarkably natural; Zanabazar's abstractions take the subtler form of perfectly exquisite surface and proportion. 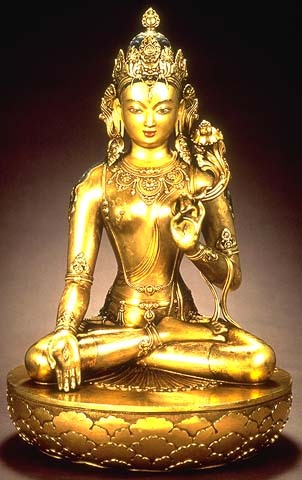 Tara lowers her right hand in a gesture of "Supreme Giving," and holds a white lotus in her left. Her hands and feet are inset with eyes; she also has a third eye in her forehead, but even these extraordinary attributes seem natural. Her "sapphire tresses" are half-knotted and half-free, and she wears a five-pointed crown that transforms itself into a kirtimukha (a protective, terrifying halo-face) at the front. Elaborate earrings and fluttering, flattened scarves surround her elongated ears, and her body is adorned with the spare, elegant jewelry of a bodhisattva, typical of Zanabazar's Nepalese-inspired sensibility. The First Dalai Lama's poem (as well as his invocation to the goddess) specifically appeals to her for long life, but it also prays for protection from danger, and access to enlightenment, hopes that are inextricably intertwined. This vision of Tara as the source of long life is based on Vagishvarakirti's revelations, which saw Tara as a sixteen-year-old girl, in every way the antithesis of death, and his dream of the goddess is perfectly captured by Zanabazar's calm, yet energized image. In the most basic sense, Buddhists in Tibet and Mongolia saw the offerings, praises, and prayers they offered to Tara as an "initiation into life,"(10) and as a way of extending and prolonging the unique opportunity for enlightenment that only human life presented. All images and text copyright The Asian Art Museum; not to be reproduced without permission.